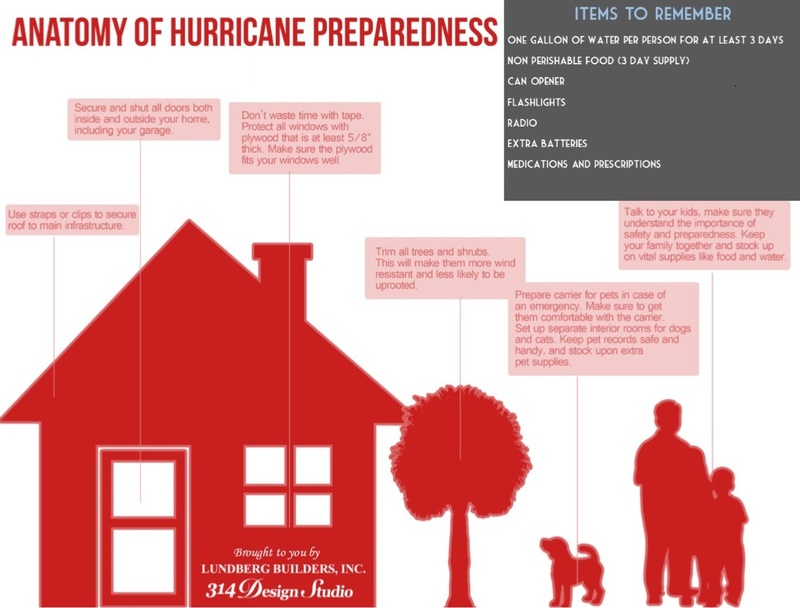 Preparing your Home & Family for a Hurricane – Lundberg Builders, Inc.
Thunder & lightening & wind, oh my! The current forecast of a hurricane means your home and other personal property could be at risk for damage from extreme winds, rain, hail and lightning. Tropical storms, including hurricanes at any level, can cause significant damage to your home and property, from missing shingles and fence posts to collapsed roofs and walls. Knowing what to expect and being prepared for the storm can make all the difference for you and your homes safety. The tips below can help you plan ahead for the upcoming storm, as well as for the future. Check your insurance coverage! Many people overlook this important step until after the fact. Assure that it reflects the current state of your home & consider adding flood insurance and coverage for additional living expenses in case your home is uninhabitable after a storm. Bonus Tip: Take photos or videos of the contents of each room. This will save you a major headache in case of a disaster. Secure windows and sliding glass doors. Although not the best option, one solution is to tape your windows.. The tape isn’t going to keep an object from breaking your window if wind flings it at your house, but it should keep the glass from flying around the room if an object does hit. It’s ideal to have heavy plywood to fit your windows on hand or metal shutters installed, but these would all need to be done in advance. We recommend using 3/4 inch plywood and drilling screw holes 18 inches apart. Once a window is broken, the wind blows inside to not only wreck the interior, but also to apply upward pressure on the roof. This is why this step is so important! Prepare and stow a hurricane emergency kit! Your kit should include bottled water (a gallon of water per person for at least 3 days is recommended), non-perishable food, a first aid kit and any medications. Don’t forget extra clothes, flashlights, a radio, extra batteries and disposable dishes. Keep these supplies in a specific spot in your home that everyone can get to quickly and easily. Store important documents such as birth certificates, social security cards, insurance policies and passports in a watertight containe r.
Have an established evacuation plan & family emergency plan in place. If you don’t have transportation of your own, make arrangements with friends or family members. 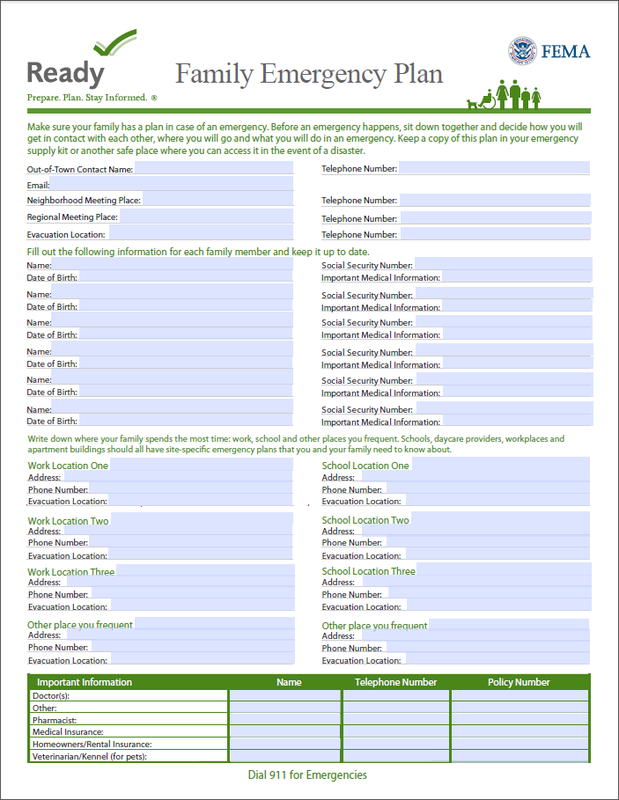 Here is an awesome printable from FEMA to help you put together a Family Emergency Plan. Click the image to the right for the full printable. Turn your refrigerator and freezer to their coldest settings to help keep food cold in case of a power outage. If you’re in an area that is prone to flooding buy sandbags. These can be used to line your house to protect against minor flooding. If your home has a pool, you’ll need some additional preparation. Items around the pool, like furniture, toys, and skimmer lids should be brought inside to avoid becoming projectiles. (Some opt to throw their furniture into the pool, but doing this can actually cause damage to the pool’s finish). Turn off the gas supply at the meter and the filter pump at the breaker and store the filter indoors during the storm. Bring in all outdoor furniture, decorations, garbage can and anything else that is not tied down. Familiarize yourself with hurricane evacuation routes in your area and where to find higher ground. Determine where you would go and how you would get there if you needed to evacuate. It’s always better to be prepared. Do not use a gas oven or range to heat your house and never run a generator inside where exhaust fumes can accumulate! If you have kids and you’ve dealt with a power outage before…you probably know the struggle. We don’t realize how much we rely on all things electric u ntil it’s not available. 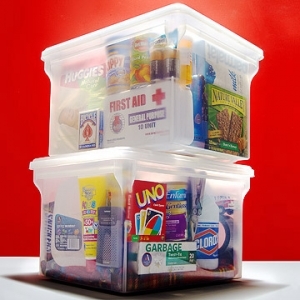 Prepare a fun emergency kit now for the kiddies so you don’t drive yourself crazy being stuck in the house. Include Play-Doh, coloring books, Lego’s, puzzles, balloons and fun surprises. Here are a few more ideas for staving off cabin fever: Flashlight tag, board games, crafts (pasta necklace anyone?) freeze dance and hide and seek. Although they are predicting that Hurricane Joaquin will stay out to sea, the forecast track is still very uncertain. Have an emergency plan in place! Taking steps now can also help preparing for a future hurricane or major storm a little less of a headache.Remember to stay tuned to your local forecast for updates and possible warnings.